torbaystrokesurvivors.jimdo.com - Website of torbaystrokesurvivors! We are a group of Stroke Survivors that meet every Thursday 1-3 pm at Paignton Library and Information Centre. We get together to learn about computers, whether it be creating a poster, sending emails or chatting via Skype (we've even called Cyprus during one of our sessions!). For some of us we are complete beginners, and others once had the knowledge, but their stroke makes it a bit more difficult to remember. 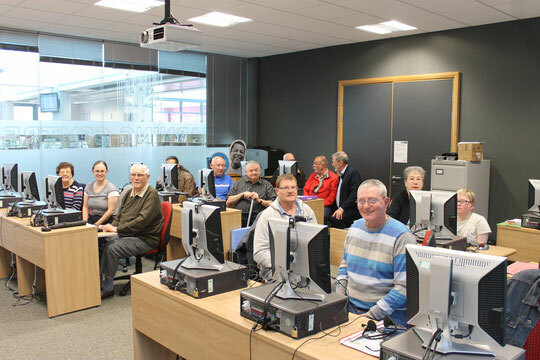 This creates an ideal atmosphere where we help each other to learn new skills, which are not always limited to computers, as an amazing by product of our sessions is the effect it is having on people's confidence and communication skills. If you'd like to learn a bit more about our group; who we are, how we started and some of the Awards we've won as a result of our work please follow the links above. As well as having information about ourselves, under the Connected Groups section above there is information about various other groups that are operating in Torbay and the surrounding area, which can provide a range of support and information not just for Stroke Survivors but for their friends and family as well. If you know of other groups and information which can help aid Stroke Survivors in their recovery, please contact us on the following email; secretarytorbaystrokesurvivors@gmail.com or click on our Contact Us page for further details. So please use the website to share your thoughts and ideas and anything you think might help and encourage stroke survivors in their journey of recovery. It could be exercises that you have found helpful, books you have read or information about aids you have found for increased mobility, any events that might be helpful. Most of all to bring Hope." To enable and empower stroke survivors of all ages to gain confidence, self-esteem and through working together we can contribute and go forward in our lives. As one member said, "I can't write, I can't read much, I can only talk with a stutter so I can't tell a joke and I feel like a complete fool. Coming to these lessons has shown me I have knowledge I can share, people do care about me and although I still feel a fool, it's a lot less of a fool." without whom we would not be here now.